Neptune moved into the zodiac sign of Pisces last week. This is a big deal. And we've already seen headlines of it. A HUGE whale shark that washed ashore in Pakistan today is a classic example;Neptune-unimaginable, Pisces- water. Big fish washing ashore is very Neptune in Pisces.It's always that way. Movement in the sky, event below. Sometimes its an inward moment, but the shift always hits the headlines in some fashion~~ almost as if Divine is seeing if we are paying attention to the 'signs'. And most of the 'signs' are going to be with WATER as a theme. Water will replace OIL as a most sought after resource (clean water that is). Many an Island will 'dissolve' in the next years, and psychic communication will become WAY COMMON! Accepted as a norm. Neptune is very comfortable in the sign of Pisces, so this will be a home-coming of sorts. Neptune rules Pisces. They fit, know each other well, and work well together to get the job done of helping us develop: Faith,compassion,imagination,astral exploration in our dreams, and transcendence. But some will also deal with: super duper addictions,infections that go on and on, denial,con-games,and dissolving of the ego. Saints will play a bigger role in our lives, and so will Sinners. You see, the choice is how we work with the energy. Lots of us will bounce back and forth. This is human nature. This is discovery of what SPIRIT is to us. Its a personal story in the collective novel. A bit like the drop of rain in the Ocean. Hard to say where one begins and the other ends. But that is the point. Merging. Merging into the oneness. That's what Jesus did. 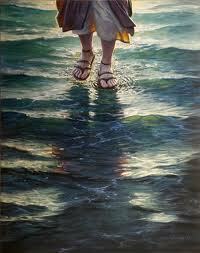 That's how he walked on water. He merged with the divine mind. There was no room (not even a slither)for doubt. Doubt says-'well maybe I can't..' and the very second that thought comes in there is a hole. An evaporation of the goal. In order to achieve 'miracles' you must have no doubt. There is only ALL KNOWING. And that comes with linking the heart with the divine mind. Faith and discipline are needed. Faith that you can, discipline to know how you can. Discipline of the mind so that it won't let the fog of doubt come rolling in. You have the next fourteen years to figure this out. How to use this journey of Neptune in Pisces to allow an unfoldment your 'higher' self. From now until June, we will see some good examples of the compassionate heart in the news. This summer will likely show the world some of the 'lower' con-man type of uses. The literary world (newspapers included) will come under more critical viewing. People will 'doubt' if what they 'read' is really TRUE reporting. This is to be a much BIGGER issue than it has been in the past. Making up stuff and then putting it out there to hang as an example of truth won't fly unless its got lots of footnotes! People will check! Frauds will be exposed on a mega level with the written word. We also are going to see some protest marches that are so BIG they will break ALL previous RECORDS of humanity uniting against those that speak but fail to act in the best interest of the majority. I also think the 'romance novel' will become much desired. Its an escape route from the mundane world that demands that we face our choices while reminding us of our duty. And sometimes we do need a little rest from 'reality'. However, since Saturn just turned retrograde today in the last degree of Libra, it's best to keep an eye on fact, as you allow fantasy to entertain you. And the high court in California says that if you are of the fancy to marry you can~ no matter if your bride is a he or a she... just wait for that war to continue to another round when Saturn turns direct June 24th. A Re-write/right of the wedding vows is a sure thing. That debate is far from over. No Judge can keep you from Instant love though,and that's starting on the 8th as Venus enters Aries and joins up with Uranus this week! Faster than a speeding arrow your heart will split open and run the race to win and woo...Happy Valentine's day early.